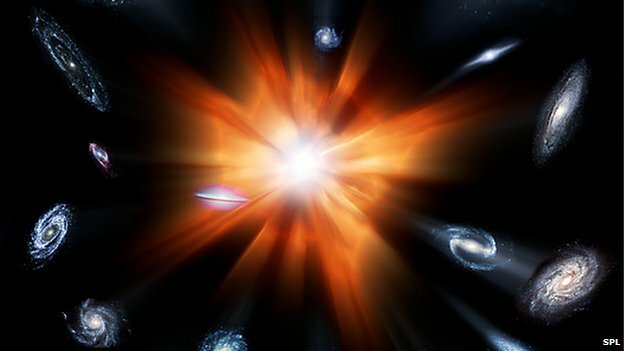 Scientists say they have extraordinary new evidence to support a Big Bang Theory for the origin of the Universe. Researchers believe they have found the signal left in the sky by the super-rapid expansion of space that must have occurred just fractions of a second after everything came into being. It takes the form of a distinctive twist in the oldest light detectable with telescopes. The work will be scrutinised carefully, but already there is talk of a Nobel. “This is spectacular,” commented Prof Marc Kamionkowski, from Johns Hopkins University. “I’ve seen the research; the arguments are persuasive, and the scientists involved are among the most careful and conservative people I know,” he told BBC News. The breakthrough was announced by an American team working on a project known as BICEP2. This has been using a telescope at the South Pole to make detailed observations of a small patch of sky. The aim has been to try to find a residual marker for “inflation” – the idea that the cosmos experienced an exponential growth spurt in its first trillionth, of a trillionth of a trillionth of a second. Theory holds that this would have taken the infant Universe from something unimaginably small to something about the size of a marble. Space has continued to expand for the nearly 14 billion years since. The signal is reported to be quite a bit stronger than many scientists had dared hope. This simplifies matters, say experts. It means the more exotic models for how inflation worked are no longer tenable. The results also constrain the energies involved – at 10,000 trillion gigaelectronvolts. This is consistent with ideas for what is termed Grand Unified Theory, the realm where particle physicists believe three of the four fundamental forces in nature can be tied together. 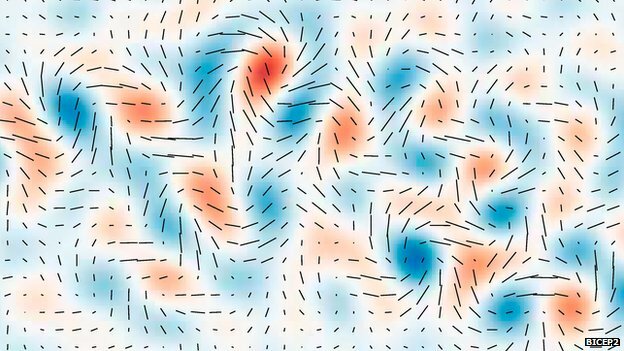 But by associating gravitational waves with an epoch when quantum effects were so dominant, scientists are improving their prospects of one day pulling the fourth force – gravity itself – into a Theory of Everything. The sensational nature of the discovery means the BICEP2 data will be subjected to intense peer review. It is possible for the interaction of CMB light with dust in our galaxy to produce a similar effect, but the BICEP2 group says it has carefully checked its data over the past three years to rule out such a possibility. Other experiments will now race to try to replicate the findings. If they can, a Nobel Prize seems assured for this field of research. Who this would go to is difficult to say, but leading figures on the BICEP2 project and the people who first formulated inflationary theory would be in the running. One of those pioneers, Prof Alan Guth from the Massachusetts Institute of Technology, told the BBC: “I have been completely astounded. I never believed when we started that anybody would ever measure the non-uniformities of the CMB, let alone the polarisation, which is now what we are seeing. If there is a “god” worthy of adoration and worship, it is motion in general. All hail movement! Creationists believe that the Earth is only 6000 years old and that the universe was created in its present state instantaneously. The big bang is completely at odds with such a viewpoint, and the two are not reconcilable. Tell that to creationists. Many of them argue that the big bang is evidence of God’s creation of the universe. Surely you’ve engaged one of those fools before? I have, unfortunately, and many of them hold to this (however incredibly absurd it is!). I try my best to avoid engaging people who cannot be convinced to change their mind no matter what evidence is presented (i.e. Ken Ham). I consider them “lost to religion” and not worth the effort. I am speaking of young-Earth creationists, not necessarily people who believe some deity is responsible for the big bang. I agree with you, trust me. I regret ever having engaged such people. You can present them with mountains of evidence, but at the end of the day they believe what they want, no matter what. Essentially, it amounts to a profound waste of both time and effort. Precisely. I used to be one of them, so I (rather unfortunately) know this! For an example, visit (if you dare) the Institute for Creation Research, and search for “big bang”. You’d be shocked by how easily they ignore evidence. Take a look at this. 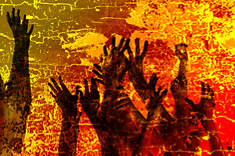 Man made religion are cults. …and the hypothesis is weak. B theory of time and general relativity go hand in hand together. Theists have been trying so hard keep to their presentist ways but sadly for them B theory of time is the greater of the two theories of time and as such the universe is eternal. It doesn’t matter if the big bang model or steady state model is true.